The Midnight Freemasons: Whither Are You Traveling? We've all seen the image in movies and television…volunteers are requested, and a line of people step back, leaving the ignorant in a forward position to do the work. I remember laughing at this scene numerous times, but now that I see the behavior so prevalent in society, it's not so funny anymore. I'm not sure if it is society mimicking Hollywood, or vice versa, and I don’t necessarily care at this point. But if any service organization wants to survive, the attitude must change. Finding people to step forward is becoming increasingly difficult these days, and it isn't just us. Within Scouting organizations, we see similar behavior. Many adults seem to prefer to drop off their kids and walk away, rather than be involved. In some instances, I've even seen some Scout leaders who remain to be heavily involved, even after their kids have aged out. Not because they necessarily want to, but because parents of the active youth simply won't step forward. Has it always been like this? We hear the stories of the World Wars, when people stepped forward in droves in order to serve their country in any way possible. People would lie about their age, simply to step forward. Was it just the culture of the time, or something that their parents instilled in them? 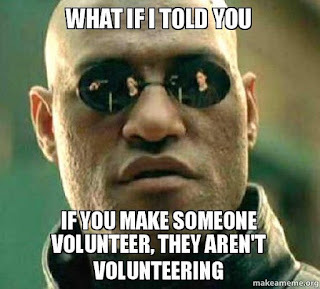 Is the plethora of 'squirrels' such as video games, social media, and 1000 channels on television ruining the trait of volunteerism, or is it the belief that somebody else will do it, so why should I? Yet more questions I wish I could ask my Father. I can't help but wonder if we as a Fraternity brought this on ourselves. Yes, we aren't supposed to 'ask' people to join, but we do hand them petitions and drop hints. I've done it. This is behavior that my father never would have done. He didn't even talk about the Fraternity. Now, I believe there is some middle ground on which to meet…between the complete mystery of a century ago, and asking people to join today. We do need to be involved in the community, I believe, and show them what we believe and the lessons we teach. But this can't be done without stepping forward. Stepping forward for fundraisers. Stepping forward for service. Stepping forward to do presentations for other groups. Simply stepping forward. So here is my plea, my Brothers. Don’t wait to be asked, step forward. Your Lodge isn't guaranteed to be here forever. Our history is not a promise of our future, I know that from my father's Lodge, the one that my great grandfather founded. It's gone. It can happen. If you care about your Lodge. If you truly care about the Fraternity. Step forward and volunteer, don't wait to be asked.